In recent years, mental health professionals who have traditionally focused on the emotional state of the individual have come to realize that problems arise from the unique interactions between particular individuals and environments. From necessity, they are beginning to look at context; no longer can they place the responsibility for mental health on the shoulders of the person alone. Most attention has been paid to the impact of educational and work settings, but it is clear that all life settings contribute meaningfully to positive psychological adaptation and must be considered in any attempt to understand a person's difficulties. This book explores the crucial ramifications of new theory and research in person-environment psychology for assessment and intervention. All practitioners seeking to deliver effective mental health services to adolescents and adults will learn from it. "Detailed explanations of P-E are accompanied by descriptions of practical methods for assessment and treatment with this approach, which is a rather refreshing departure from the popular and traditional theories and viewpoints that 'place responsibility for mental health on the shoulders of the person alone.' Professionals, including researchers and academicians, seeking a different and unconventional system for understanding and assessing emotional difficulties will find it in this book." Contents: Part I:Introduction. W.E. Martin, Jr., J.L. 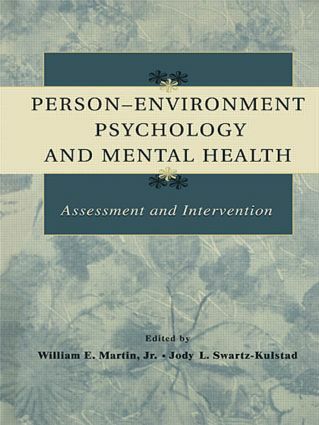 Swartz-Kulstad, An Introduction to Person-Environment Psychology and Mental Health: Assessment and Intervention. Part II:Person-Environment Psychology and Mental Health: Assessment Strategies. R.L. Munger, Comprehensive Needs-Based Assessment With Adolescents. C.B. Horton, J.E. Bucy, Assessing Adolescents: Ecological and Person-Environment Fit Perspectives. L.M. Koehly, V.A. Shivy, Social Environments and Social Contexts: Social Network Applications in Person-Environment Psychology. Part III:Person-Environment Psychology and Mental Health: Intervention Strategies. R.V. Dawis, The Person-Environment Tradition in Counseling Psychology. C.M. Borduin, N. Heiblum, M.R. Jones, S.A. Grabe, Community-Based Treatment of Serious Antisocial Behavior in Adolescents. J.L. Swanson, S.P. Chu, Applications of Person-Environment Psychology to the Career Development and Vocational Behavior of Adolescents and Adults. J.L. Swartz-Kulstad, W.E. Martin, Jr., Culture as an Essential Aspect of Person-Environment Fit. Part IV:Conclusion. W.E. Martin, Jr., J.L. Swartz-Kulstad, Focal Points for Person-Environment Psychology: Ecological Validity, Systems Orientation, Fit, and Efficacy.